Ukraine: Where Will The Russian-Backed Rebels Attack Next? KIEV, Ukraine -- Analysts and journalists have begun to ask where the Russian-backed separatists in eastern Ukraine will go next, now that the second ceasefire agreement has failed. 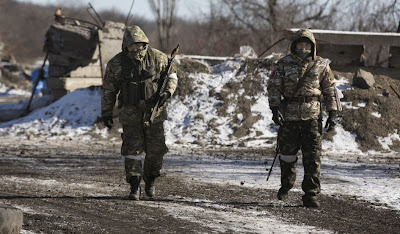 Fighters with the separatist self-proclaimed Donetsk People's Republic Army walk at a checkpoint along a road from the town of Vuhlehirsk to Debaltseve in Ukraine, in this picture taken February 18, 2015. Skirmishes on the frontline in Shyrokyne, less than 10 miles from Mariupol's city limits, have raised concerns that Mariupol will be the next target. Geographically and commercially speaking, Mariupol makes sense. It's the busiest commercial marine hub on the Azov Sea and considered a must-have for Russia if a land corridor to Crimea is ever to be realized. Mariupol would also be a symbolic coup for the separatists. Ukrainian President Petro Poroshenko named the city the provisional capital of the Donetsk region in 2014. The separatists have also threatened to take the city. Alexander Zakharchenko, head of the Donetsk People's Republic, warned that separatists will take Mariupol if Ukrainian forces continue their "aggression." Mariupol won't become the next frontline for two reasons. First, the separatists don't have the military capabilities; second, taking Mariupol would require an influx of troops that the separatists can't possibly deploy without assistance from "Russian volunteers." The Kremlin would lose all plausible deniability of involvement in the conflict if it were to deploy 100,000 troops to eastern Ukraine. Mariupol represents a completely different challenge for the 30,000-35,000 fighters that constitute rebel forces in eastern Ukraine. The battles in Debaltseve, Shyrokyne and Pavlopil have served as primary examples of the types of environments most favored by the separatists. At Debaltseve, separatists relied on small assault groups backed by artillery and armored vehicles. But even in the case of Debaltseve, analysts in Russia and eastern Ukraine noted that the separatists were exhausted and probably lacked the reserves to "finish the job." In other instances, the confined, close-quarters fighting that characterized the battle for the Donetsk International Airport in January catered to the small battalion-sized units that comprise the rebel forces. More importantly, the airport terminals provided ample fortification that allowed the separatists to employ small-unit defensive tactics, which nullified the size advantage of the Ukrainian forces. An advance on Mariupol would require the rebels to adopt tactics that are currently impossible without a large influx of manpower. Moreover, the question of where this influx would come from exposes the limits of Russian involvement in eastern Ukraine. On February 2, Zakharchenko announced a plan to boost the separatist fighting force to 100,000 men. The announcement raised questions as to how and from where the separatist leadership could find 100,000 able-bodied recruits. "Mobilization is the first stage; there will be volunteers first and we will see what do next." An offensive in Mariupol would require prolonged Russian engagement, unlike Russian involvement in Ilovaisk and Debaltseve. The deployment of senior Russian officers to plan the assault, as was the case in Debaltseve, would be insufficient. The element of surprise, which allowed Russian heavy armor to inflict heavy losses on the Ukrainian forces in Ilovaisk, would also be gone. According to John E. Herbst, director of the Dinu Patriciu Eurasia Center at the Atlantic Council, the Russians would need to "use huge firepower to take the heavily fortified city" and it would result in "many [Russian] casualties." There's no way that Russian President Vladimir Putin would approve a plan that would expose the Kremlin's involvement. He has repeatedly denied that Russian troops are fighting in eastern Ukraine, and an admission would expose his country to greater sanctions and international ire. The next offensive will likely occur north of Donetsk. Situated 10 miles north of Donetsk but controlled by Ukrainian forces, Avdiivka has a population of less than 35,000 but is home to the Avdiivka Coke and Chemical Plant, one of Europe's largest coke producers. Seizing the plant would not only be a strategic coup for the separatists, due to its role as the major supplier of coke for the Donbas steel industry, but it would also strengthen the relationship between the separatists and Rinat Akhmetov, one of Ukraine's richest men and owner of the Avdiivka plant. Moreover, residents may be receptive to separatist control; most locals watch Russian satellite television, as Ukrainian television channels do not work in the city. Mariupol as a frontline represents a bridge too far for separatist ambitions and is "all speculation without foundation," according to Adrian Karatnycky, a nonresident senior fellow with the Atlantic Council's Transatlantic Relations Program. Swallowing up more accessible targets like Avdiivka will allow separatist leadership to promote their narratives of legitimacy and resilience while still receiving support from Russia.